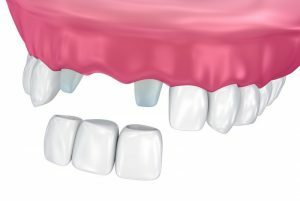 A dental bridge is used to fill a gap caused by a lost or extracted tooth. Natural in appearance and extremely durable, a dental bridge is supported to stay in place by dental crowns placed on the adjacent teeth. At Thurloe Street Dental and Implant Centre, we can restore the gap in your teeth with a dental bridge in just a few visits. Bridges are an excellent long-lasting solution to missing teeth and blend into your smile for a completely natural and unnoticeable restoration. Our dentists are highly experienced in fitting dental bridges and will explain each stage of the process to you prior to your treatment. Enjoy a rejuvenated smile when you visit our team. Please click here or call 020 7584 5551 to book your appointment now.